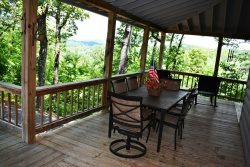 Come experience "Little Rock Creek Retreat," a 4 bedroom, 2 bath cabin that boasts a secluded, forested location in the North Georgia Mountains. Not only does this cabin provide guests with a private location that's ideal for relaxation, but is only a short drive away from the biggest attractions in the mountains. Don’t miss out on the many unique activities and outdoor experiences North Georgia has to offer. Meander the streets of Blue Ridge or Ellijay where you will find one of a kind shops, breweries and eateries. Take a ride on the Blue Ridge Scenic Railroad, Hike the Appalachian Trail, Visit a waterfall or the swinging bridge, Tube, Kayak, Paddle Board or White Water Raft the Toccoa or Ocoee River’s. Go boating on Lake Blue Ridge or step back in time and watch a first run movie at the famous Swan Drive-In Theater. The kids would love a visit to the Bigfoot Museum and of course Mercier Orchards is a must. There is always a festival or event happening here in the mountains. There are two bedroom’s on the main level of the home, one with a king bed, one with a queen bed and also a full bathroom. On the lower level of the home there are two additional bedroom’s, one with a king bed and one with a queen bed plus a bathroom with a shower. The kitchen is fully equipped with solid surface countertops and stainless appliances. You will not miss any of the luxuries of home as this cabin has free WiFi, Flat Screen TV’s, Washer/Dryer and Dishwasher. What more can you ask for. Step down into the game room complete with Pool Table, Sofa’s and a Flat Screen TV. Step outside and enjoy a relaxing evening in the Hot Tub while you star gaze or some s’mores on the outdoor fire-pit. The cabin was exactly as described and is perfectly situated for day hikes. LITTLE ROCK CREEK RETREAT. Was an amazing experience. It's close to town for quick store trips. And you can step out the front door and hear the creeks running. Its withing minutes hiking paths and waterfalls. I plan to stay here many times. The cabin itself has everything you need to cook meals, grill, and even relax in a jacuzzi. I would highly recommend little rock creek retreat! We loved it! Our first vacation in Georgia and we felt right at home! Beautiful property in the perfect Location to surrounding areas! We were able to grill out, hang in the jacuzzi, and have and outside fire! I can't wait to do it again! The creek and falls close by are absolutely beautiful and worth the hike! Great property for a large family. Close to everything. Our cabin was a very comfortable stay for our family of 8. We also appreciated the fact that it was pet friendly which is hard to find. The creek is very peaceful and we enjoed our stay!! Everything was so clean and just described online!! !